Chak B (110) v LCFC Academy (-4): Chak B win by 114 runs! For reports, scorecards and photos, click here. 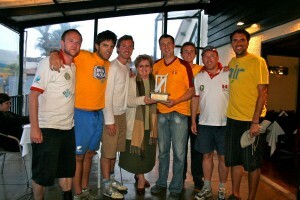 END OF SUMMER OUTDOOR SEASON – For a full breakdown of prizewinners from the 2010 Summer Season, click here. LCFC (134 for 7) lost to League All-Star XI (138 for 4) by 6 wickets. Lima Llamas (88 all out) lost to Tacna Tigers (90 for 5) by 5 wickets. Game 1: Kiteflyers (43 for 2) defeated LCFC (43 for 5) by losing fewer wickets. Game 2: Chak De (47 for 4) lost to Eidgenossen (50 for 0) by 5 wickets. Game 3: Chak De (57 for 3) defeated Kiteflyers (48 for 2) by 9 runs. Game 4: LCFC (52 for 2) lost to Eidgenossen (56 for 1) by 4 wickets. Game 5: Kiteflyers (69 for 1) defeated Eidgenossen (52 for 4) by 17 runs. Game 6: Chak De (53 for 5) lost to LCFC (54 for 2) by 3 wickets . Final: Eidgenossen (57 for 2) lost to Kiteflyers (59 for 1) by 4 wickets. 20 overs: Northern Hemisphere (90 for 8 ) lost to Southern Hemisphere (92 for 3) by 7 wickets. 10 overs: Northern Hemisphere (69 for 5) lost to Southern Hemisphere (76 for 3) by 7 wickets.